Aviation and aerospace safety engineers concerned with Foreign Object Elimination (FOE) can choose from an extensive array of Gear Keeper stock and custom tethering systems. Virtually eliminating a tool left behind, aviation maintenance and repair service employees can use the tool and then let it go as it safely returns to Gear Keeper’s secure tool storage position. A tool inadvertently left behind during a maintenance or repair service has the potential to bring down a plane. At best it can cause repairs, flight delays, plane changes and fuel inefficiencies. Internationally, Foreign Object Damage (FOD) costs the aviation industry about Euro 10.000.000.000,00 per year in direct and indirect costs. A recent Insight SRI survey4 indicated that 300 of the world’s largest airports, which collectively service about 55 million aircraft movements per year, have reported more than 60,000 FOD incidents. Fortunately, many of these instances can be virtually eliminated by a Gear Keeper retractable tool tethering system that will prevent anyone from leaving a tool behind. Aviation and aerospace safety engineers concerned with Foreign Object Elimination (FOE) can choose from an extensive array of Gear Keeper stock and custom tethering systems. Manufactured in the U.S.A. by Hammerhead Industries, the Gear Keeper line of tool and instrument tethering systems is the world’s largest and most comprehensive. With over 3.000 different lanyards and retractable tethering configurations, a Gear Keeper system will fit virtually every aviation/aerospace tool or application. The patented Gear Keeper Retractor is at the core of an extensive product line utilizing four different retractors from light to heavy duty. Each of the retractor mechanisms is engineered for retraction forces that are balanced for the weight of the tool being used. The result is effortless extension and retraction without arm strain or harmful “snap-back.” An employee can use the tool and then let it go as it safely and automatically returns to Gear Keeper’s secure tool position. 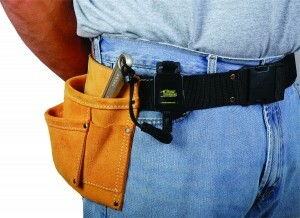 The modular Gear Keeper system has an impressive array of benefits and features including; lanyard lengths from 70 to 107 cm, patented self-flushing system (that clears sand and debris), salt-water proof, withstands high-temperature environments, keeps tools close to the body thereby avoiding potential entanglement issues and a ratcheting gear that minimizes lanyard length and arm strain. There is also a large selection of mounting options for attaching the lanyard to the user including a 360° Rotating Belt Clip Mount, Threaded Stud Mount, Heavy Duty Snap Clip Mount, Velcro Strap Mount and Epaulet Mount. For more information about the Gear Keeper Modular Retractor System — or any of the company’s other innovative tethering products, the full line of Gear Keeper’s tool and instrument tethers, lanyards and accessories contact the European distributor Avera Distributing in The Netherlands. This entry was posted in GearKeeper and tagged avera, avera distributing, Aviation, FOE., Foreign Object Elimination (FOE) standards, Gear Keeper, gearkeeper, IAQG, NAFPI, NCATT. Bookmark the permalink.